Breakdown: What's Happening With India’s Tank Force? 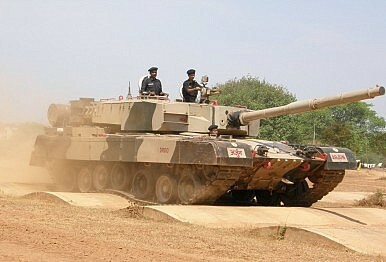 New Delhi has so far failed to successfully mass-produce an indigenously developed modern main battle tank. The majority of India’s indigenously developed third generation Arjun main battle tanks have been grounded due to technical issues and missing spare parts, Defense News reported last week. Originally supposed to enter service in the Indian Army in the 1980s, the Arjun MK-I program has witnessed repeated delays due to an inadequate design concept (e.g., too much heavy armor versus too little horsepower) that is partially based on the German Leopard II main battle tank, and a flawed procurement and testing process. Defense News quotes an Indian official who stated that “nearly 75 percent of the 124 [Arjun] tanks with the Army are grounded.” All in all there are more than 90 technical issues. “The problems in the Arjun tank are mainly confined to its transmission system, targeting and thermal sights,” the defense official noted. Originally, more than 50 percent of components of the tank were imported, but this percentage has gradually diminished as various parts have been replaced by indigenous designed systems. Yet the tracked vehicle still requires foreign hardware to function and those supplied have dried up, according to the official. “This prompted the Ministry of Defense (MoD) in late April to form a committee, headed by a retired three-star armored corps officer, to resolve the component shortages and reactivate the MBTs within two months,” IHS Jane’s Defense Weekly reported. The Arjun MK-I tank was developed by the Defense Research and Development Organization (DRDO) and produced by the Indian Ordnance Factory’s production facility in Avadi in southern India. The official noted that the Indian Army was obliged to acquire 124 tanks by the DRDO so that the factory could remain in operation. Due to the repeated delays, India decided to acquire T-90s main battle tanks from Russia in the early 2000s. While the first 310 were directly imported from Russia, India is currently locally producing a customized and improved version of the T-90, the T-90 M Bhishma. As of now, a grand total of 500 T-90 and T-90 M tanks are operated by the Indian Army. India plans to field 21 tank regiments of T-90s by 2020 through license-production, with 62 tanks per unit and more than 1,300 armored fighting vehicles total, although that number could go up (see: “The Main Battle Tanks of Asia: Junk or Still Useful?”). However, DRDO is also working on an improved version of the Arjun, the MK-II, which has done very well in comparative trials with the T-90M, according to Defense News. It sports more than 93 improvements over the older version and with around 60 percent locally manufactured components is less depended on foreign imports, a DRDO official said. “If the experience gained from Mark-1 is utilized fully there should be lesser technical problems with Mark-2 at present though reports of trials do not suggest the same,” Rahul Bhonsle emphasized. In September 2014, the Indian Army has placed an order for 118 MK-II tanks. However, a decision to indigenously develop a new anti-tank missile to be fitted onto the MK-II will, in all likelihood, delay the induction of the upgraded platform. India to Develop and Build 1,770 New Armored Fighting VehiclesRussia’s T-90M Main Battle Tank to Complete State Trials in 2019India and Pakistan’s Main Battle Tank Forces: An OverviewRussia Orders 132 T-14 Armata Main Battle Tanks and T-15 Infantry Fighting VehiclesIs China Equipping Its Marine Corps With a New Lightweight Battle Tank?